We are always trying to offer you a new and improved experience. With that, Way Out West Ranch and JR Productions would like to introduce our newest resident trainer: Aaron Brookshire. While Aaron specializes in Reined Cow Horse and Working Ranch Horse, he welcomes all horse and riders that have a desire to learn whether you are just beginning, or competing at the non-pro level. Ride with the best, win with the best! Call him to set up a lesson. James and Remy are excited to add Aaron as a compliment to their training and lesson program. As well as hoping to have another winning trainer as part of their establishment! Great venue, good cattle, awesome atmosphere, gorgeous awards! Don’t miss this show! 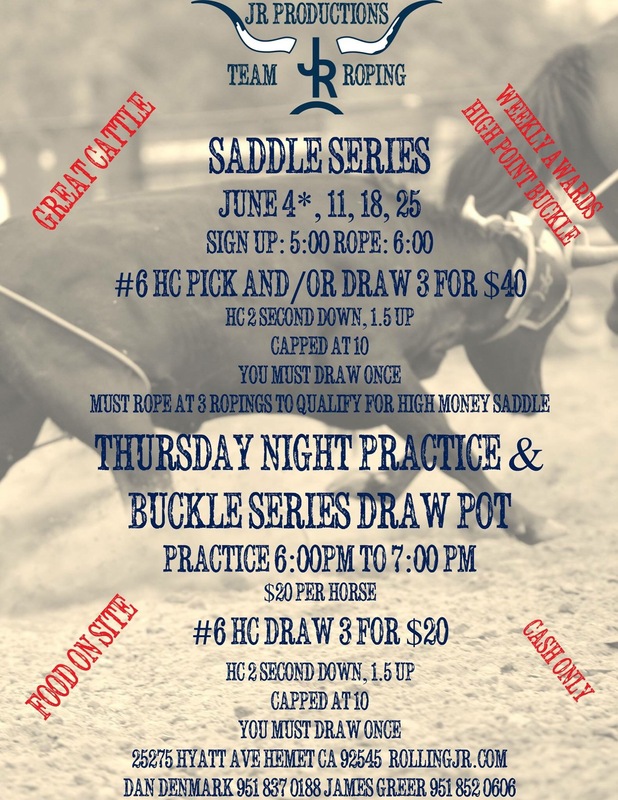 Come out and rope! Practice 6-7, #6 HC Draw at 7. Books close at 6:45. Text entries to 9514734146 if you’re going to be late! Steak or Chicken Caesar Wraps are on the menu!